Dr. Beanes was born in Upper Marlboro, Prince Georges County in Maryland in the year 1749. He was the son of a prominent planter. Educated in Scotland at the University of Edinburgh, he became a Doctor and returned home to Maryland. Still living at the time of the War of 1812, he resided in Upper Marlboro, around which some of the preliminary battles to seize Washington, D.C. were being fought in September of 1814. And this is where Dr. Beanes begins his intersection with history. 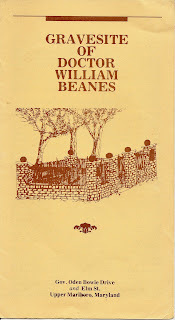 The British were foraging for food and supplies when they arrived at Dr. Beanes home. He identified himself as a Federalist, the Ameican political party which was vehemently opposed to the war with Britain. He even went so far as to let them take whatever they needed, and was so cooperative, that he was paid full market value for everything that the British took from him. They then proceeded on their journey, leaving 4 men behind. 2 of these were "stragglers", who had become seperated from their units. The other 2 were deserters, and had they been caught by the British, would be hung. The following day found Dr. Beanes strolling across his fields with American General Bowie when they noticed 2 men lurking nearby. These were the "stragglers." A short time later the deserters were captured as well and all 4 were held in Upper Marlboro. The news spread quickly and soon the British had sent a squad back to the town to collect the prisoners. They gave the town until noon the next day to produce them or else the entire town would be burned. The next day the town gave them the "stragglers", who were after all, still enemies, but refused to give up the deserters. By this time they had been removed to Queen Anne County for safe keeping. When the British began to make preparations to burn the town, Dr. Beanes quickly offered himself in exchange. This was a remarkable man, who, at one moment is dealing with the enemy for provisions in a war to which he is opposed, the next moment finds him capturing the enemy and then aiding in hiding 2 of them before finally offering himself up in an effort to spare his town! When the British left Upper Marlboro, a Mr. Weems and Dr. Hill rode to Georgetown, where Richard West, a friend of Dr. Beanes, contacted his brother-in-law, Francis Scott Key, a prominent attorney and also brother in law to Richard Taney. The trio were able to contact President Madison and he dispatched Mr. Key, along with the Presidents emissary for Prisoner exchanges, John Skinner, aboard the USS Minden to seek out the British Fleet and arrange for the release of Dr. Beanes. Starting downriver from Baltimore the Minden located the British at the mouth of the Potomac, just as they were about to turn and head towards Fort McHenry and Baltimore. They had already burned Washington, D.C., and the capture of Baltimore would be another "feather in their caps." 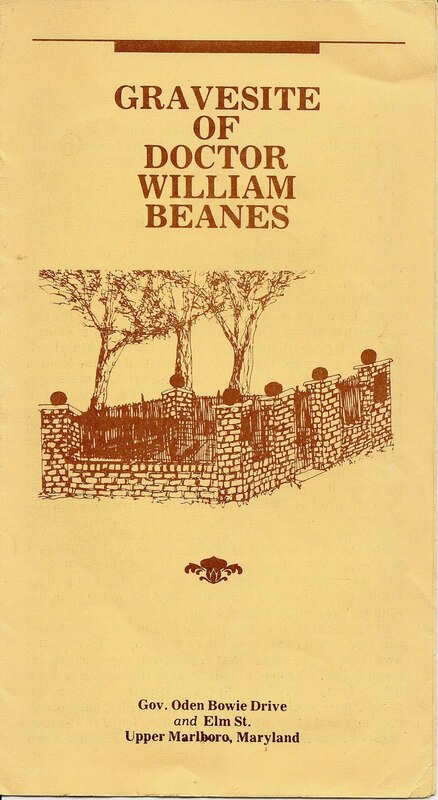 The British were, at first, reluctant to release Dr. Beanes, and both Mr. Skinner and Mr. Key were apalled at the condition of Dr. Beanes, who was being held in solitary confinement and on reduced rations. But as affidavit after affidavit poured in from the British commanders in the field, attesting to Dr. Beanes fair treatment of the British, both General Ross and Admiral Cochrane agreed to his release. However, as Skinner and Key had been aboard too long, and heard too much about the British plans, all three would be held until the following day, when the battle for Baltimore would, presumably, be over. That night the British sailed up river to Fort McHenry and the bombardment began. Throughout the night both Key and Skinner struggled in vain to see if the flag had been "struck", or lowered, indicating a surrender on the part of the Americans. But as the dawn broke, and the smoke cleared, Key could see "by the dawn's early light, what so proudly we hailed, at twilights last gleaming..." The flag was still flying when the British turned around.